EXPLORER, MISTRESS, VAGRANT, LOAFER, ARTIST, TRAMP ... THEY ARE ALL AT THE CAPTAIN'S TABLE! Vivien Leigh, Simone Signoret, Jose Ferrer and Lee Marvin all give mature and passionate performances in this adaptation of Katherine Anne Porter's 1962 novel recounting the voyage of a German ship as it leaves Mexico on its way to Bremerhaven, Germany, prior to World War II, in 1931. The film highlights how the voyage is fraught with anti-semitism, unrequited love, xenophobia and dissatisfied lives. For Stanley Kramer’s 1965 epic Ship of Fools, we head back to the Depression Era. Set in 1933, the film follows a vessel that takes a nearly four-week cruise from Mexico to Germany in the days before the inauguration of the Nazi reign. We first meet ship’s physician Dr. Schumann (Oskar Werner), a young physician who tires of his job on the boat after only a few voyages. He plans to quit once they return to Germany. We also get to know many of the ship’s inhabitants. These include Mary Treadwell (Vivian Leigh), a bitter middle-aged American who stays fairly aloof. Jenny (Elizabeth Ashley) and David (George Segal) are a young American couple getting to know each other – in separate cabins. The deported La Condesa (Simone Signoret) comes on board in Cuba on the way to exile. Herr Rieber (Jose Ferrer) is a German nationalist in tune with the Nazi spirit; he’s none to happy that he’s given Jewish jeweler Lowenthal (Heinz Ruehmann) as a cabin mate. Tenny (Lee Marvin) is a rough-hewn, racist American, and Glocken (Michael Dunn) is a dwarf who acts as our commentator at times. The story follows their paths and their interactions as we learn more about them. You know how movies like Speed and Passenger 57 were referred to as Die Hard On A… flicks? As in “Die Hard On a Bus, Die Hard On a Plane, etc. You don’t hear it much, but I think there’s also a genre of “Grand Hotel On A…” efforts. That’s how I’d classify Fools: it’s Grand Hotel on a boat. 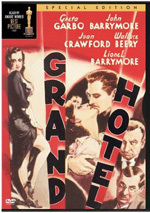 That doesn’t mean it’s as good as Grand Hotel, though. While I wouldn’t refer to that sudsy flick as a classic, it nonetheless creates a lot of lightweight entertainment. Fools aspires to greater pretensions but falls short of virtually all goals. Not only does it fail to create a deep, meaningful piece, but also it lacks much entertainment value. No one could ever call Kramer a master of subtlety, and Fools occasionally suffers from his sledgehammer touch. The movie makes its politics abundantly clear. Of course, the only genuinely happy people on the boat are the ones who take the Will Rogers mindset; everyone else is saddled with varying levels of meanness and/or misery. The movie also takes occasional breaks from the action to telegraph its various social points. Putting the story at he dawn of Nazi Germany offers plenty of easy targets. The film might’ve been more controversial if it’d dealt with Civil Rights-era America, but it’s not exactly on risky ground when it mocks the Nazis. If they made this flick 30 years earlier, it would’ve been daring and revealing. Created in 1965, though, it feels stale. I wouldn’t mind the failed social commentary if the damned thing actually kept my attention for more than a few minutes here and there. It takes awfully long to develop its characters, and even with a two-and-a-half hour running time, it still doesn’t take them much of anywhere. We don’t feel like we know them much better at the end than we did at the beginning, as the majority of the roles remain one-dimensional and stiff. It doesn’t help that Fools throws way too many roles at us. This spreads the film too thin, as even with all that running time, it barely exposes us to a lot of the characters. Granted, since even the ones who we see frequently stay thinly developed, but at least they get a half-hearted shot at real personalities. Too many story threads go down dead end streets or just vanish entirely. Fools also suffers from some odd ending. It jumps abruptly from intense drama to broad comedy, and the elements often fail to integrate. A lot of simply jerky cuts occur too, as though the filmmakers accidentally ended scenes a few frames too early. There’s no logical storytelling reason for these sudden segues, so I chalk them up to poor editing. Fools throws out some good performances, such as Leigh’s tough, hard turn as Mrs. Treadwell. Of course, some other acting choices become disconcerting; we see a romance between the doctor and La Condesa even though Signoret looks old enough to be Werner’s mother. (The film claims that La Condesa is only a year older than Dr. Schumann, and Signoret actually was just a tad older than Werner, but they sure don’t look so close in age.) With some script tightening and better character development, Fools might’ve been interesting, but the actual flick bores. Ship of Fools appears in an aspect ratio of approximately 1.85:1 on this single-sided, double-layered DVD; the image has been enhanced for 16X9 televisions. The transfer never excelled, but it satisfied. For the most part, sharpness seemed good. A little softness interfered with some wider shots, but those instances remained minor. The movie usually looked accurate and distinctive. No problems with jagged edges or shimmering emerged, and edge enhancement was minimal. Source flaws were occasionally distracting but not too bad. I saw occasional instances of specks, marks, lines and other blemishes. These failed to become too significant, however, as the movie was generally clean. Grain could be a bit heavy, though. Blacks came across as deep and full, and shadows were smooth and well-rendered. The movie held up fairly well after more than four decades. I also felt perfectly satisfied with the monaural soundtrack of Fools. Speech sounded reasonably natural and concise. No edginess marred the presentation, and the lines showed decent fidelity. Music was a minor factor in this largely score-free flick, but when we heard those elements, they displayed adequate clarity and delineation. Effects were similarly fair. No, they didn’t impress, but they also failed to create distractions or concerns. This was a more than adequate for an older flick. A few extras complete the set. An Introduction from Karen Kramer provides one minute and 50 seconds of remarks from the director’s widow. She provides a few notes about the production, her husband’s involvement in it, and the praise it received. As with other Kramer introductions, this one doesn’t add much but it doesn’t hurt. Two featurettes follow. On Board the Ship of Fools goes for 27 minutes and 58 seconds as it combines movie clips, archival pieces, and interviews. We hear from Karen Kramer, editor Robert Jones, and actors Elizabeth Ashley, George Segal, Alec Baldwin and Barbara Luna. “Board” looks at casting and Stanley Kramer’s popularity as a producer and director, characters and performances, the source novel and its adaptation, editing and Kramer’s work with the actors, shooting on stages, and some reflections on the production. “Board” becomes a decent overview of the flick. It focuses on the actors since most of the observations come from their perspectives, so it lives and dies with them. Segal and Luna are a little bland, but Ashley provides some pretty saucy notes and is consistently interesting. The overall package can be a but fluffy, but it gives us some worthwhile facts about the movie. Voyage on a Soundstage runs 10 minutes, 49 seconds and features script supervisor Marshall Schlom and cinematographer Laszlo Kovacs. “Voyage” concentrates on Fools cinematographer Ernest Laszlo and his work on the film. It provides an informative and introspective view of the movie’s look and the filmmaking theories of its director of photography. Finally, we find a Photo Gallery. This shows a running montage of shots accompanied by music that lasts four minutes, 17 seconds. We see pictures from the production along with some publicity stills and images from the premiere. It’s an above average collection of photos, though I’m not wild about the presentation. A soap opera with pretensions, Ship of Fools rarely manages to hold the viewer’s attention. It suffers from choppy editing, thin characters and less-than-coherent storytelling. The DVD provides acceptable picture and audio as well as a few decent extras. I don’t care for the movie, but the DVD proves reasonably satisfactory. Note that you can buy this version of Ship of Fools as part of a five-movie set called “The Stanley Kramer Film Collection”. That release retails for $59.95 and also includes Guess Who’s Coming to Dinner, The Wild One, The 5000 Fingers of Dr. T and The Member of the Wedding. A separate DVD of Fools does exist, but it offers a pan and scan cut of the flick and isn’t the same as this one.